and an expression of nature and the seasons which can be enjoyed with the eyes and the tongue. "Genkainoajidokoro, Shimakawa", authentic Japanese cuisine of the four seasons unique to Japan You can enjoy the hospitality of Japanese cuisine, savoring the colorful and delicate arrangement with the eyes, and relishing the dishes, which value the flavor of the ingredients, with the tongue. Inside the restaurant is a calm and relaxed atmosphere, and there are also numerous private rooms. You can enjoy your meal at your leisure, without the need to be concerned with your surroundings. "Okoze" (Stonefish) is considered a high grade fish in Japan, with somewhat soft white flesh, and an exceptionally mild flavor. As the flesh is firm, you can enjoy its crunchy texture and rich savory taste. 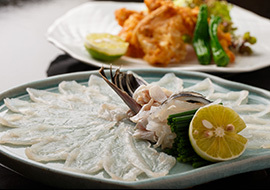 "Hamo" (Pike Conger) has a delicate savory flavor, and is superb in early summer to midsummer, the season when fat content is at its highest. ※This is has become a 15,000 yen course . 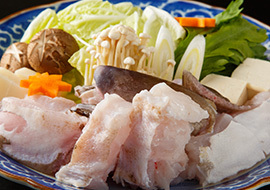 The more you chew "Fugu" (Pufferfish), the more the flavor comes pouring out. In Japan, this fish is so popular that it is referred to as the king of winter. 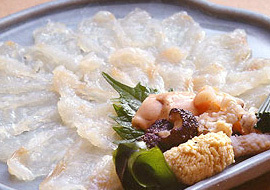 "Ara" (Saw-Edged Perch) has a sweetness as well as a good texture. It produces a rich stock with a good aftertaste, making it exquisite in a hotpot. ～All season～Information on the Omakase CourseThis is a course which allows you to enjoy recommended dishes which we have bought in on that day. Please feel free to inform us of any food that do not like, or allergies that you have. At this restaurant we recommend you to enjoy the four seasons with our course meals. 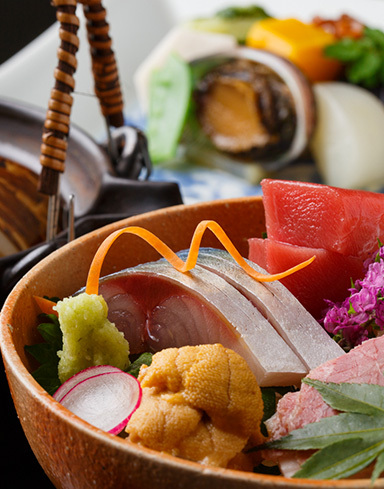 Please leave the cooking to us and fully enjoy Japanese cuisine at your leisure. please tell us that you saw the website. 7 minute walk from Hakata Station. Sunday / National Holidays ※We take reservations on Sundays and national holidays.